It is vitally important to take care and attention when it comes to the timber used for the construction of a log cabin – this is by far the most prominent raw material present in the building and affects every factor of it including the looks, the strength and of course the longevity of the product. With this in mind we make a point of making the quality of timber used our number one priority when manufacturing a log cabin and we feel you should do the same when looking to buy one! Of course it’s important that you like the look of your chosen log cabin, the size needs to be the right fit for you and naturally you will be keen to get the best price possible for your purchase – but the quality of the timber used should be a more prominent factor than anything else because that’s what will determine the ease of use, ease of maintenance, lifespan and overall value for money that you get from your purchase. There’s no point buying the cheapest log cabin on the market, that looks great on the photos, only for it to arrive covered in knotholes and splits, become a nightmare to fit together and then suffer from months of problems due to warping and water ingress before finally failing beyond repair within just a couple of years. Having suffered these same painful problems ourselves when we first began importing cabins many years ago we vowed that once we began to manufacture log cabins directly ourselves we would source only the very best quality timber available to allow us to create a product we could be proud of but also one that would last longer and provide our customer with a much better building. This is something we have stuck to rigidly ever since and we are happy to report that the results speak for themselves. One of the most important factors when grading timber is the rate at which it is grown. Timber that has grown slower will benefit from much higher density due to its grain being much closer together. This provides strength and stability to the timber and prevents it from being as susceptible to the most common pitfalls such as splits, knotholes and warping. The growth rate of timber is greatly affected by the temperature of the region in which it is grown, the cooler the climate – the slower the growth – the denser the wood, and for that reason timber grown from within the artic regions and other very cold states is generally considered to be the most solid material. 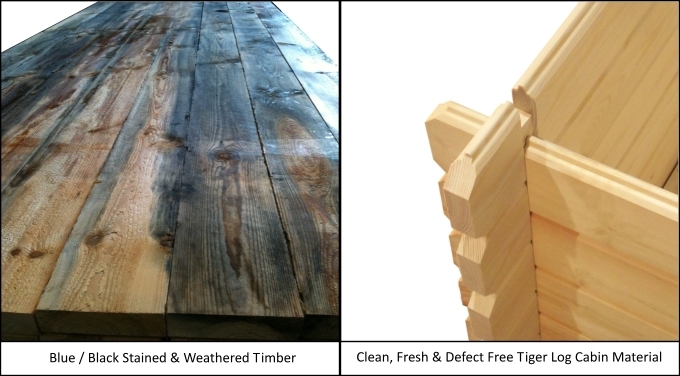 All of the above timber is purchased as ‘kiln dried’ which ensures the moisture content within the material is maintained to a consistent level to prevent warping or disfiguring. These are generally accepted as the highest grades of timber available for the manufacture of products this size and although these grades would be more commonly associated with specialist handmade furniture manufacture, due to their excellent and consistent quality, we believe they are the only materials that will satisfy the quality of our log cabins. Considered by many competitors and importers, who pitch their products at the very bottom of the pricing scale, as being too good to be used within garden building manufacture these premier timber are characterised by their lack of large knotholes and wane. It is unfortunately very common within the industry for our competitors to source their timber from Estonia, Lithuania or Latvia, where many of their factories are actually based. Timber from these regions has a very bad reputation for having been harvested too quickly to maximise the cost effectiveness of the product and reduce the price to the end buyer – the downfall is of course that this results in much weaker, split and knotty, lower grade timber, sometimes not even having been kiln dried, which is prone to problems and will result in a poor quality end product. One huge advantage we have almost exclusively over the rest of the market when it comes to selling log cabins in the UK is the fact that we control the whole process from importing the timber raw materials to shipping the products ourselves at our own UK based factory. We select the timber to purchase ourselves and check it fully to meet our high standards upon arrival to the UK – if it is not up to scratch it will not even enter our timber mill, let alone stand a chance of making its way into a building. The next step along the process is for us to machine the timber to our own profile at our large and highly advanced timber mill in Leeds – we run each piece ourselves with skilled and experienced staff whose main prerogative is to ensure the timber is machined accurately and to as high a standard as possible. They are well aware of where the final materials are going and will ensure they are machined exactly right so they are fit to be used within the building. Following this all machined logs are then carefully checked and cut to length / notched in our manufacturing and assembly plant, again based here in Leeds, where each component is lovingly made and then checked before being packed and loaded into individual cabins. We then even deliver the buildings ourselves, on our own wagons, with our own drivers. Armed with this knowledge of each complicated process within the product cycle it’s not hard to see how easily mistakes can be made. Staff can grade the timber incorrectly, cut things wrong or select the wrong item at any step of the way which is why we feel it is so important to oversee the whole procedure – we find the best way to ensure its done right, is to do it ourselves! 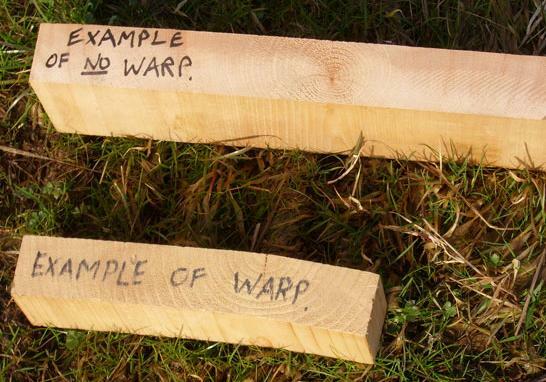 Whilst timber is a natural product and of course there will always be occasions during it’s life cycle it may succumb to the appearance of minor splits or shakes there are certainly clear signs to look out for that separate the sort of high quality timber that we use in our cabins from those of much cheaper ‘problem prone’ alternatives. Severe splitting and knotholes – Another side effect of cheaper and lower grade timber is the tendency for the presence of large splits, multiple dead knots and general deficiencies of the material. Like most things in life you tend to get what you pay for when it comes to timber it is unfortunately a common problem for other cabin manufacturers to purchase the cheapest grade of timber they think they can ‘get away with’ – with the results being log cabins featuring lots of cracks and holes which are not weatherproof and frankly could not be described as fit for purpose. All of the timber used for our log cabins is purchased from the highest grade available and checked for the presence of severe splits or knotholes.